Cite this podcast as: Helman, A, Coombs, C, Holland, A. Pediatric Physical Abuse Recognition and Management. Emergency Medicine Cases. March, 2018. https://emergencymedicinecases.com/pediatric-physical-abuse/. Accessed [date]. For those children who survive their physical trauma, there are both short term and long term effects. Short term effects include risk of escalating abuse with increased risk of morbidity and mortality. Long term effects include developmental delays, mental health issues, chronic disease and substance abuse according to the ACEs Study. The unfortunate truth is, if we don’t think about abuse, we’ll definitely miss it. So, the most important first step is always simply to think about it. Then our responsibility turns to reporting it, considering the differential diagnosis, investigating what is medically necessary and ensuring appropriate follow up or admission if necessary. Much as with sentinel bleeds of subarachnoid hemorrhages, even seemingly trivial injuries of abuse can be viewed as “sentinel events” for much worse outcomes in the future. According to Sheets et al in 2013, as many as 25% of abused infants had prior sentinel injuries. One reason we miss physical abuse in these kids is that most sentinel injuries are minor injuries such as bruises, intraoral injuries, or simple fractures and we overlook the real significance of these injuries, which is that they provide an opportunity for us to intervene before more serious injury occurs. As EM providers, recognizing and responding appropriately to sentinel injuries protects kids. Failure to do so can result in repeated abuse and subsequent morbidity and mortality. Remember though that no child is immune from abuse and an absence of the above risk factors does not preclude one from investigating suspicious injuries further. Indeed, it is in this population that abuse is often missed. As children learn to run, walk and explore new environments, they are bound to hurt themselves. Teasing apart which injuries are due to normal childhood rambunctiousness and those that are a result of abuse requires vigilance and a thorough assessment. Remember to fully undress your patients in order to complete a head to toe exam (Teeuw et al 2012) that won’t miss subtler injuries. Signs of disciplinary abuse are usually found on areas of the body that are concealed by clothing such as the back and buttocks. Any injury in a young infant. The most common abusive injury is a bruise. Kids bruise often, but certain scenarios should raise alarm bells. A) Bruising in the pre-mobile infant. Pierce et al found that only 1.3% of infants less than 5 months old had bruising. Feldman et al found that over 50% of pre-mobile infants with bruising were victim of abuse. Make certain you base your assessment on the child’s developmental stage and not absolute age. Bruising in infants is very rare. Not all of these babies are abused but they almost always (ie, unless there was significant trauma in a public setting with multiple witnesses) warrant further evaluation for child abuse. Pearl: Think of a subconjunctival hemorrhage in an infant as a bruise on the eyeball and frenulum injury as a bruise to the frenulum. These injuries are highly suggestive of abuse in the infant. It is helpful when consider whether or not a patient has too many bruises to compare with bruise prone areas such as the shins. Don’t try to age/date bruises as physicians are unreliable at determining the age of bruises. While there are no fractures that are pathagnomonic for abuse, any fracture in any age group can be abusive depending on how the fracture was sustained. Most abusive fractures occur in children < 18 months of age so again, our highest level of suspicion should be in young children. An important exception is that of the Toddler’s fracture which requires little force and can occur from simple falls. Baldwin 2011: The odds of a femur fracture being abuse rather than accidental trauma was 19 times greater for children < 18 mo of age. Pandya 2010: Children < 18 mo with a humerus fracture had a 32 greater odds of being the victim of abuse. Location: Proximal and mid shaft humeral fractures are more likely due to abuse whereas distal humerus/supracondylar fractures are less likely to be due to abuse. Deye 2013: A small (~5%) but not insignificant number of infants < 12 months old with apparently isolated skull fracture undergoing abuse evaluation were found to have additional unexpected fractures on skeletal surveys. Most acute fractures are symptomatic but there are some fractures (metaphyseal fractures and rib fractures) which are often occult and only identified on imaging and are highly concerning for child abuse. These fractures may be found “incidentally” when getting imaging for a different reason (ie, a rib fracture seen on a chest xray obtained in an infant with suspected pneumonia) but need to be addressed the same as any abusive injury. Every injury can be caused by abuse. Nothing is pathognomonic for abuse. Signs of abusive head trauma can be subtle and non-specific. 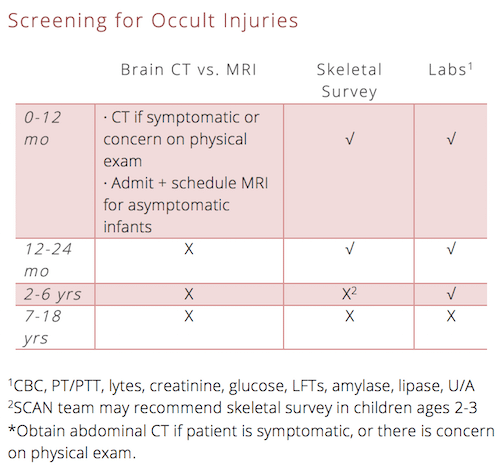 The Pittsburgh Infant Brain Injury Score (PIBIS) by Berger et al (see below) can help decide which patients warrant head imaging. Skull fractures are most often accidental, but a small proportion are associated with abuse according to Deye et al in 2013. Increase your suspicion for abuse if skull fractures are complex, bilateral, depressed, open, presenting with suture diathesis or occipital fractures. Human bites have typical, stereotyped pattern. Some severe injuries (see head trauma) can present with very non-specific symptoms. This is why it is so important to fully examine all concerning patients. The two most common conditions that mimic bruising are Mongolian spots and hemangiomas. Compared to a bruise, Mongolian spots (congenital dermal melanocytosis) are bluish-green and located on the buttocks/lower back, present at birth, are non-tended, and fade over months to years. Hemangiomas are also non-tender, subcutaneous, and proliferate over time. If in doubt, use POCUS! Many conditions may predispose a child to bruising and bleeding including HSP, ITP, leukemia and hemophilia, and consider osteogenesis imperfecta and rickets in children who present with fractures as a result of a minimal force mechanism. The basic medical evaluation for suspected physical abuse in a young child includes a skeletal survey, head imaging, and trauma labs. Which children suspected of abuse require a skeletal survey? Detailed guidelines for skeletal survey in young children can be found here. As a general guide: Any child < 2 yo in whom you suspect abuse should undergo a skeletal survey. Head trauma in young children may present with non-specific symptoms. Signs and symptoms of abusive head trauma in an infant or young child can be subtle or non-specific (sleepy, vomiting, fussy, lethargic) or even completely absent and these are the cases we often to fail to recognize. Serum hemoglobin <11.2g/dL (1 point). At a score of 2, the sensitivity and specificity for abnormal neuroimaging was 93.3% (95% confidence interval 89.0%–96.3%) and 53% (95% confidence interval 49.3%–57.1%), respectively. Proper documentation can be challenging but is extremely important in these scenarios. The chart is a medicolegal document that may be called upon if an investigation takes place. Call for help. Discuss the case with social work, child protective services, a child abuse consultant (eg. SCAN team), and the primary care physician. To admit or not to admit? If you are concerned about the child’s safety, then admit to hospital for observation and further work up. Discharge from ED only if the medical evaluation is complete and safe disposition can be arranged by child protective services from the ED. What is our responsibility in reporting of suspected pediatric physical abuse? The specific rules around reporting abuse vary across the jurisdictions, but the fundamental principle is the same: health care providers need only reasonable suspicion that a child is being harmed to report, not “proof”. We are penalized for failing to report suspicion, not for reporting unsubstantiated suspicion. Reporting to the provincial or state child welfare office is legally mandated. Reporting to pediatric specialists and healthcare centers specializing in child abuse pediatrics is often useful but does not fulfill that legal mandate. Sentinel injuries are minor injuries with major significance. These may appear minor, but are often missed and provide an opportunity for us to intervene before serious injury. No child is immune from abuse. 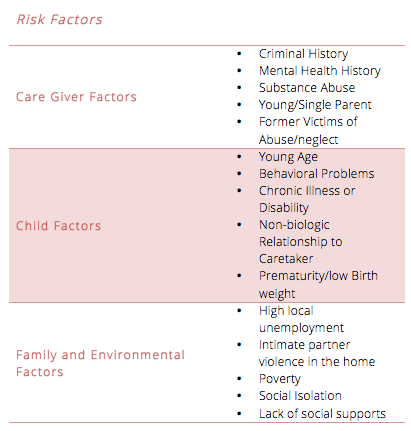 While risk factors for abuse may be helpful in triggering a suspicion for abuse, many children who suffer from abuse have no identifiable risk factors. The most common abusive injury is a bruise. If you don’t cruise, you don’t bruise. Keep an eye out for the 6 B’s of child abuse. Head trauma in young children may present with non-specific symptoms. Be suspicious in the right clinical context. Concerning features for abuse are subtle. These include delay in seeking care, vague or changing history of trauma, mismatch of history and injury or developmental stage of child, and multiple or patterned injuries. Certain injury patterns should always raise concern for abuse. These include posterior rib fractures, subdural hematomas, immersion burns, patterned bruises and others. None are pathognomonic. Use the TEN-4 FACE decision tool. The basic medical evaluation for suspected physical abuse in a young child includes a skeletal survey, head imaging, and trauma labs. There are recommendations when and when not to investigate. Report abuse when you are suspicious – it is your legal responsibility. Regional guidelines vary, but report based on suspicion, not on proof. 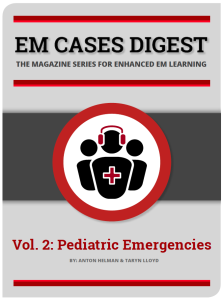 EM Cases Digest Vol. 2 Pediatric Emergencies here. Christian CW. The evaluation of suspected child physical abuse. Pediatrics. 2015;135(5):e1337-54. Tiyyagura G, et al. Barriers and Facilitators to Detecting Child Abuse and Neglect in General Emergency Departments. Ann Emerg Med. 2015;66(5):447-54. Pierce MC, Magana JN, Kaczor K, et al. The Prevalence of Bruising Among Infants in Pediatric Emergency Departments. Ann Emerg Med. 2016;67(1):1-8. Pierce MC, Kaczor K, Aldridge S, O’flynn J, Lorenz DJ. Bruising characteristics discriminating physical child abuse from accidental trauma. Pediatrics. 2010;125(1):67-74. Kemp A. Abusive head trauma: recognition and the essential investigation. Arch Dis Child Educ Pract ED. 2011; 96:202-8. Wu SS, Ma CX, Carter RL, et al. Risk factors for infant maltreatment: a population-based study. Child Abuse Negl. 2004;28(12):1253-64. Kellogg ND. 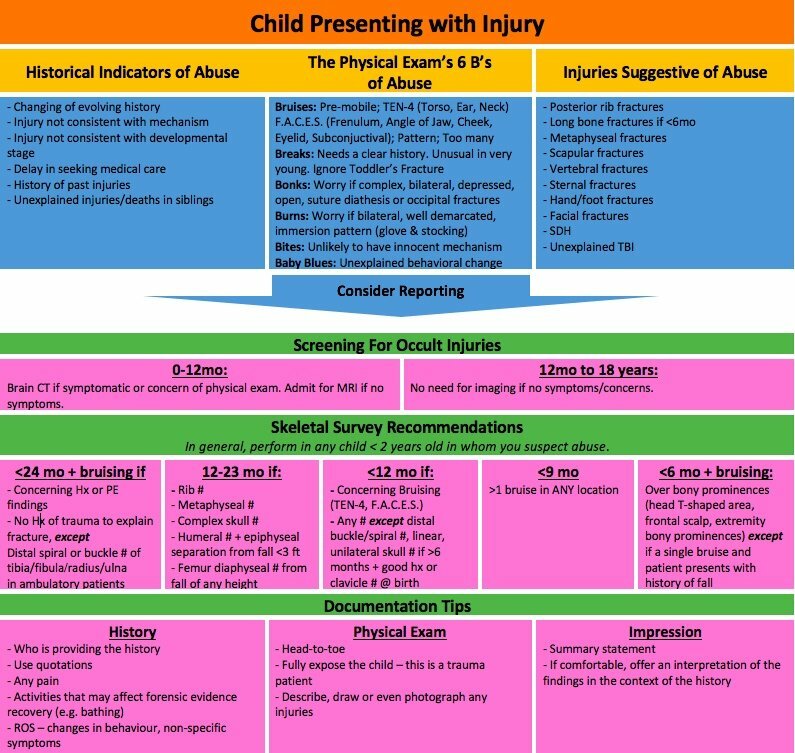 Evaluation of suspected child physical abuse. Pediatrics. 2007;119(6):1232-41. Maguire S, Mann MK, Sibert J, Kemp A. Are there patterns of bruising in childhood which are diagnostic or suggestive of abuse? A systematic review. Arch Dis Child. 2005;90(2):182-6. Laskey AL, Holsti M, Runyan DK, Socolar RR. 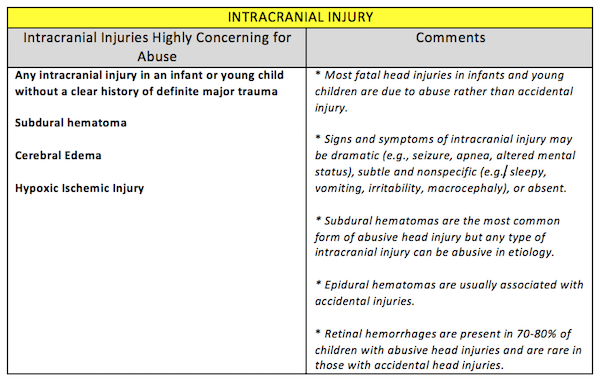 Occult head trauma in young suspected victims of physical abuse. J Pediatr. 2004;144(6):719-22. Bulloch B, Schubert CJ, Brophy PD, Johnson N, Reed MH, Shapiro RA. Cause and clinical characteristics of rib fractures in infants. Pediatrics. 2000;105(4):E48. Ricci LR. Positive predictive value of rib fractures as an indicator of nonaccidental trauma in children. J Trauma. 2004;56(3):721. Barnes PM, Norton CM, Dunstan FD, Kemp AM, Yates DW, Sibert JR. Abdominal injury due to child abuse. Lancet. 2005;366(9481):234-5. Bax, B, Wang, N.E. Physical Abuse of Children: Identification, Evaluation, and Management. Pediatric Emergency Medicine Reports. 2012. Maguire SA, Kemp AM, Lumb RC, Farewell DM. Estimating the probability of abusive head trauma: a pooled analysis. Pediatrics. 2011;128(3):e550-64. Wood JN, Fakeye O, Mondestin V, Rubin DM, Localio R, Feudtner C. Development of hospital-based guidelines for skeletal survey in young children with bruises. Pediatrics. 2015;135(2):e312-20. Sittig JS, Uiterwaal CS, Moons KG, et al. Value of systematic detection of physical child abuse at emergency rooms: a cross-sectional diagnostic accuracy study. BMJ Open. 2016;6(3):e010788. Teeuw AH, Derkx BH, Koster WA, Van rijn RR. Educational paper: Detection of child abuse and neglect at the emergency room. Eur J Pediatr. 2012;171(6):877-85. Paul AR, Adamo MA. Non-accidental trauma in pediatric patients: a review of epidemiology, pathophysiology, diagnosis and treatment. Transl Pediatr. 2014;3(3):195-207. A special thanks to TREKK – Translating Emergency Knowledge for Kids for recruiting Dr. Coombs and Dr. Holland for this podcast. 1. Which of the following is NOT a potential historical indicator for pediatric physical abuse? 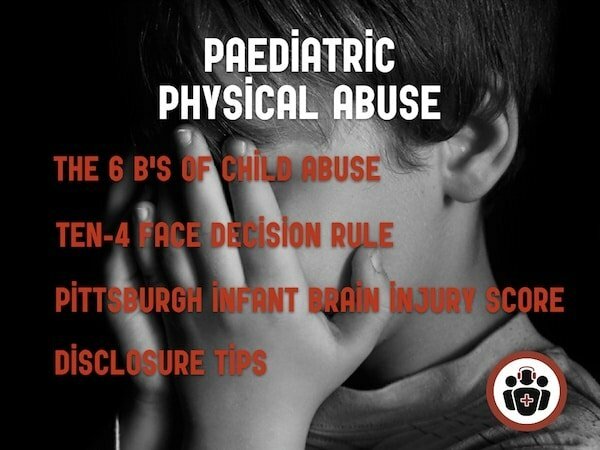 All of the above options above are historical indicator for pediatric physical abuse. 2. What is the most common abusive injury in a child? The most common abusive injury is a bruise. 3. Bruising in an unusual/protected area is concerning for physical abuse in children. Which of the following is NOT one of these areas? To remember which areas are unusual for bruising in a child’s body, use the TEN-4 FACES rule. 4. Which of the following statements is TRUE regarding fractures in pediatric physical abuse? Proximal and mid shaft humeral fractures are more likely due to abuse. Most abusive fractures occur in children < 18 months of age. Classical metaphyseal fractures occur in children who have been shaken violently back and forth. 5. You are seeing a 2 year old girl who was brought in by his mother for a 2 week history of cough. On exam, you notice multiple bruises on his abdomen and neck. What investigations would you order for this patient? In children younger than 2-3 years old who are suspected victims of physical abuse, skeletal survey and blood work should be ordered as screening investigations. Typical blood work for suspected pediatric physical abuse include CBC, PT/PTT, electrolytes, creatinine, glucose, LFTs, amylase, lipase, and U/A. 6. Which of the following does the PIBIS score for abusive head trauma NOT take into account? This patient has a score of 4 from abnormal dermatologic exam, age ≥ 3.0 months, and hemoglobin < 11.2g/dL. At a score of 2, the sensitivity and specificity for abnormal neuroimaging was 93.3% (95% confidence interval 89.0%–96.3%) and 53% (95% confidence interval 49.3%–57.1%), respectively. 7. Which of the following statements regarding reporting pediatric physical abuse is FALSE? While special rules around reporting abuse vary across jurisdictions, the fundamental principle is the same: health care providers need only reasonable suspicion that a child is being harmed to report, not “proof”. We are penalized for failing to report suspicion, not for reporting unsubstantiated suspicion. 8. A mother who works as a physician, brings in her 3-month old male infant for inconsolable crying. This evening, her husband was in the other room putting the infant to sleep when she heard a loud cry and he has since been inconsolable. When you examine the infant, you notice a bruise across his cheek and ear. You consider child abuse but recognize the mother is one of your colleagues who recently married a local police officer, and they seem very happy together. What do you do? A Don’t mention it. People of higher socioeconomic status and who are employed are less likely to abuse their children. B Do a work-up to exclude other causes that may mimic child abuse, communicate your concern and call CAS. D Don’t mention it. As one of your colleagues, she and her partner would less likely abuse their child. Remember though that no child is immune from abuse and an absence of risk factors does not preclude one from investigating suspicious injuries further. Indeed, it is in this population that abuse is often missed. Remember “if you don’t cruise, you don’t bruise”. 9. You are seeing a 18-month old female in the ED. She was brought in by her father because she refused to walk since a fall that happened yesterday. She was playing with her step-brothers when she fell. On exam, she is tender on palpation of her right shin and it is slightly swollen. An X-ray reveals an undisplaced spiral fracture through the distal tibial shaft. What do you do next? A. This is a Toddler’s fracture. Put on a cast and sent to fracture clinic for follow-up. B. Do a skeletal survey to look for other injuries. C. This type of injury is similar to a femur fracture and has a high likelihood of child abuse. Call CAS. D. This is a classic metaphyseal fracture consistent with child abuse. Call CAS. Most abusive fractures occur in children < 18 months of age. So again, our highest level of suspicion should be in young children. An important exception is that of the Toddler’s fracture which requires little force and can occur from simple falls. I would like to comment that, at least in paramedic school and in practice, we were taught toe to head for children. I forgot to add a thanks for the podcast and all the great information that is being shared! I’m sure that the physical exam is so second nature that it wasn’t even a thought for y’all. Great podcast ! Notes are well written as well ! Thanks alot, waiting for your next podcasts !